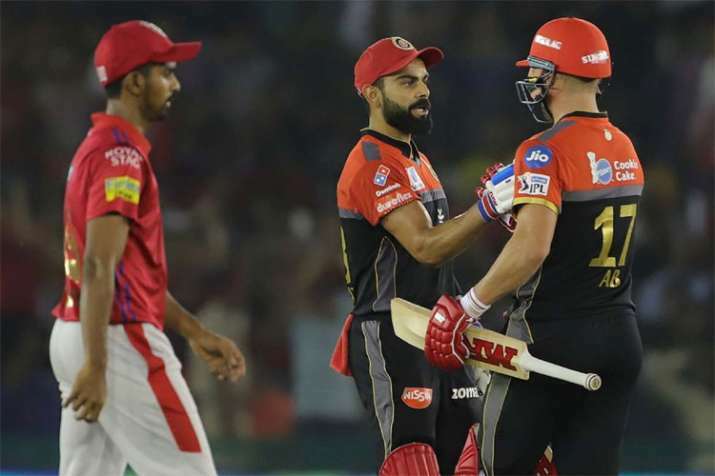 In 174 chase, Virat Kohli and Ab de Villiers smashed half-century to take their team to the victory line for the first time this season. * Winning really does taste sweet! Bangalore tried, tried and tried but without any success in the last six games. Then, they got a 5-day break, rejuvenated and have come out trumps in this match! They will be really delighted at the moment after getting the monkey off their back. Bangalore will like to believe that this is the start of their resurgence and from hereon, they will go on a roll. 23.37 IST: Sarfaraz Khan to Marcus Stoinis, STOP THE PRESS! BANGALORE HAVE WON! Another short delivery outside off, Stoinis slaps it down to wide long off and steals two runs. 23.36 IST: Sarfaraz Khan to Marcus Stoinis, FOUR! Two more needed. Sarfaraz bowls it flat and short on middle, Stoinis hops back to make room and bludgeons it over the bowler's head for a boundary. Kohli is pumped up in the dugout. 23.32 IST: Mohammed Shami to Marcus Stoinis, FOUR! Fine, fine shot! Shami misses his yorker by a few inches and ends up serving a low full toss on off. Stoinis manages to get under that delivery and pumps it down to long off for a boundary. The fielder was standing up, so it's a safe shot. * Mohammed Shami to bowl the 19th over. 23.25 IST: Andrew Tye to AB de Villiers, SIX! Bowl there to this batsman and he will hit you every single time, even in his sleep. Short and wide outside off, begging to be hit, de Villiers latches onto it and plunders it over covers for a maximum. 23 needed more off 14 balls. 23.23 IST: Andrew Tye to Marcus Stoinis, FOUR! One more in the over. 8 off the first two balls, all the pressure built in the last four overs getting released. Short and wide outside off, Marcus rocks back and whacks it through backward point. Tye is looking dejected. 30 needed off 16 balls. 23.21 IST: Andrew Tye to Marcus Stoinis, FOUR! Tye has been poor all evening. Starts with a full ball on the pads, easy pickings for any batsman, Stoinis picks it up and flicks it behind square leg for a boundary. 23.15 IST Mohammed Shami to Virat Kohli, OUT! A wicket out of nowhere! Kohli is dismissed and he is looking shell-shocked. A short delivery again by Shami, this time Virat takes on the challenge to play the pull shot but ends up playing it flat and straight towards Murugan Ashwin at deep mid-wicket who jumps and takes it brilliantly over his head. The fielder is standing quite inside the rope there, not sure whether it's a plan or not but it has certainly worked. 46 needed off 27 balls. This match is not over yet. 23.12 IST: Mohammed Shami to Virat Kohli, Extra bounce from a good length around middle, Kohli hits it early and it goes off the upper half of his bat. Goes down through mid on and they switch ends. 23.08 IST: Murugan Ashwin to Virat Kohli, The length is on the shorter side outside off, it's bowled through the flatter trajectory, Kohli cuts it through cover-point for a run. Ashwin knows that Kohli very rarely plays sweep, so he has square leg up and point in the deep. Smart captaincy. * The strategic break has been signaled! The story is the same as it was in the last break - Bangalore in control, if Punjab do not get wickets quickly, this game is going to slip away. Will there be a change in the story or will the visitors chase this down easily? 22.58 IST: Sam Curran to AB de Villiers, FOUR! That's Mr. 360 for you. Curran bowls a back of a length ball on the leg side, de Villiers was already across as he paddle scoops it behind to the fine leg fence for a boundary. 22.55 IST: Sam Curran to Virat Kohli, Fuller on the pads, Kohli flicks it again to mid-wicket and calls for a couple but the fielder was quick on the ball as he keeps them down to one. * Sam Curran is back on! 22.53 IST: Andrew Tye to Virat Kohli, FOUR! Poor line from Tye and he gets punished. He bowls it on a length on the pads, Kohli has to just put bat on ball and he does better, as he flicks it over backward square leg and into the fence. 22.47 IST: Ravichandran Ashwin to Virat Kohli, FOUR! Short and wide and it has been put away! The batter goes back and cuts it through point. The 50-run stand is up, half the job is done and half is left. 22.38 IST: Ravichandran Ashwin to Virat Kohli, Fuller on the pads, Kohli flicks it on the leg side and takes a single. * Ravichandran Ashwin is back into the attack. 22.34 IST: Murugan Ashwin to Virat Kohli, Given nice amount of air, Kohli strokes it towards cover who dives to his right and saves a run. Every run is important at the moment, need such efforts in the field to build pressure. 22.30 IST: Andrew Tye to AB de Villiers, FOUR! Slapped and Slapped hard. * Andrew Tye is into the attack now. 22.26 IST: Murugan Ashwin to Virat Kohli, FOUR! Consecutive boundaries! Top shot, this. Slightly short and it is the googly, Kohli picks it and whips it through mid-wicket. The fielder in the deep slides and looks to stop it but only manages to push it on the ropes. 22.25 IST: Murugan Ashwin to Virat Kohli, FOUR! Poor ball and put away! Short and wide outside off, Kohli goes back and cuts it through point. The timing is such that there is no chance for the fielder to chase it down. 22.19 IST: Mohammed Shami to AB de Villiers, FOUR! Just short and AB has punished it with ease. Shami bowls a short ball outside off, de Villiers is already on the back foot as he punches it through the gap at covers. The ball races to the fence with ease. 22.16 IST: Ravichandran Ashwin to Parthiv Patel, OUT! In the air... taken! The skipper, takes it on himself and delivers the goods. Excellent bowling this. He slows it up and gives it a lot more air. Parthiv comes down the track and looks to go big but only manages more height than distance. Agarwal at long off takes it. 22.15 IST: Ravichandran Ashwin to Virat Kohli, FOUR! That's his bottom hand power. Ashwin bowls it flat and on off, Kohli drives it hard to the right of the bowler and into the long on fence. 22.12 IST: Sam Curran to Parthiv Patel, FOUR! 15 from this over! 4th boundary for Parthiv. This is short and on the body, Patel helps it on its way over the short fine leg fielder and itno the fence. 22.11 IST: Sam Curran to Parthiv Patel, FOUR! Dealing in boundaries are Bangalore! Top shot. Full and on off, Patel smashes it past the bowler and into the fence. 22.09 IST: Sam Curran to Virat Kohli, FOUR! Lovely shot! There is not a lot wrong with that delivery. This is a length ball on off, Kohli strokes it on the up and past the diving mid off fielder for a boundary. 22.07 IST: Mohammed Shami to Parthiv Patel, FOUR! Parthiv gets into the act now. Shami bowls it fuller to Parthiv, on his pads, Parthiv whips it with ease and through mid-wicket for an easy boundary. 22.05 IST: Mohammed Shami to Virat Kohli, FOUR! Make that two in two. Shami bowls this fuller on the pads, Kohli flicks it through mid-wicket and finds the gap with perfection. 22.04 IST: Mohammed Shami to Virat Kohli, FOUR! That's classic Kohli. Starts with a full ball on off, Kohli just shows the full face of the bat and drives it straight past mid off for a boundary. 22.00 IST: Sam Curran to Parthiv Patel, FOUR! What a start to the run chase for the visitors. Curran bowls a half volley outside off. Patel says thank you very much, he strokes it through covers and the ball races away. 21.59 IST: Virat Kohli and Parthiv Patel are out there in the middle for RCB. Sam Curran has the ball for Punjab. 21.54 IST: Punjab were going great guns at one stage but after losing KL Rahul, they slowed down just a bit. Bangalore managed to pick a few wickets at regular intervals and tried to choke the flow of runs through their spinners but the presence of Chris Gayle meant that they failed to gain the upper hand at any time. As mentioned, Bangalore's spinners did a commendable job in their combined eight overs and Navdeep Saini also left his mark by bowling four economical overs. Umesh Yadav and Mohammed Siraj were the ones who travelled to all parts of the stadium and had a dismal outing. 21.50 IST: Outstanding knock by Christopher Henry Gayle and Punjab have posted a very challenging total on the board. Bangalore, though, will feel that they have pulled things back a shade towards the end. Just a reminder, Gayle was trapped lbw on a nought but was not given and Virat Kohli didn't review the decision. It has cost them 99 runs and that also provided Punjab a big start in the Powerplay. 21.45 IST: Mohammed Siraj to Chris Gayle, FOUR! He does not, he ends up on 99. However, a boundary to end the innings! Full and wide again outside off, Gayle throws his bat at it. He gets it through backward point and a boundary results. 11 from the last5 over and PUNJAB FINISH ON 173/4! 21.42 IST: Mohammed Siraj to Chris Gayle, FOUR! Carved over point! The second half of the over has started well for the hosts. A full toss outside off, Gayle carves it over the point fielder and a boundary results. On 95, 2 balls to go. 21.41 IST: Mohammed Siraj to bowl the last over. 18 more needed for 180. Will Punjab get it or no? 21.39 IST: Umesh Yadav to Chris Gayle, SIX! You bet, it has! Deposited into the stands! 16 from the over. Misses the yorker, ends up bowling a full toss. Gayle won't miss out. He hoicks it into the mid-wicket stands. 21.37 IST: Umesh Yadav to Chris Gayle, DROPPED! The skipper drops Gayle with 8 balls to go. How costly could this prove. It was coming to him quickly but should have been taken. A low full toss, Gayle smashes it flat towards long on. Kohli runs in and gets two hands to it but fails to grab it. The batsmen take a run. 21.34 IST: Umesh Yadav to Chris Gayle, FOUR! It is in the gap and a boundary! Boundary on the very first ball in the over, pressure on the bowler. A low full toss on middle, Gayle flicks it towards the deep mid-wicket fence. It bounces once and crosses the ropes. 21.30 IST: Navdeep Saini to Mandeep Singh, FOUR! Mandeep gets hold of one this time and it is in the gap! The short ball and it is the slower one. Mandeep waits for it and pulls it away from deep square leg. De Villiers runs to his right and gets a hand to it but can't stop it. 21.23 IST: Mohammed Siraj to Chris Gayle, SIX! Gayle has timed that to perfection. That is colossal. HUGE! Short and on middle, Gayle goes back and pulls it right off the middle, it goes deep in the mid-wicket stands where a spectator takes it. Punjab would hope, this should probably get them going now. 21.13 IST: Yuzvendra Chahal to Chris Gayle, FOUR! Easy pickings! A leg spinner pitching down the leg side and further spinning down, Gayle manages to get some wood behind it and sends it whistling to the fine leg fence. 21.09 IST: Moeen Ali to Sam Curran, OUT! Two wickets in quick succession for the visitors and they are right back in the gap. The promotion up the order has not worked. Sam goes for the reverse sweep but misses. He is hit right in front, an appeal and the umpire raises the finger. 21.04 IST: Mohammed Siraj to Sarfraz Khan, OUT! Well, well, well, for the third time tonight, a batsman hits a biggie and then is dismissed on the very next ball. That seems to be the trend tonight. Credit to the bowler also, he bowls a good short ball on the body of the batsman. It zips through. Sarfaraz looks to pull but the ball brushes his glove and goes into the mitts of the keeper. Patel takes it and appeals but Khan walks. 21.02 IST: Mohammed Siraj to Sarfraz Khan, SIX! Outrageous! A paddle scoop that goes all the way. This was on the cards though as it is one of his favourite shots. He goes down on one knee and then scoops it. It is right off the middle and it goes all the way. 20.53 IST: Yuzvendra Chahal to Sarfaraz Khan, FOUR! Swept and swept fine! Sarfaraz likes this shot and he has played it well. Poor delivery though. It is down the leg side, Khan sweeps it through short fine leg and a boundary results. 20.51 IST: Moeen Ali to Chris Gayle, Fullish and on off, Gayle gently pushes it to long off for a run. A tidy over from the Englishman. So, at the halfway mark, Punjab are 90/2! 20.48 IST: Sarfaraz Khan is the number 4 batsman. It's looking more like Bangalore are facing an army of their own ex-players. 20.46 IST: Yuzvendra Chahal to Mayank Agarwal, OUT! BOWLED 'EM! What a delivery this is! You hit Chahal for a maximum and he would get you on the very next ball. That is exactly what he has done on two occasions here. This though is a rippa. This is flatter and it pitches on middle, Agarwal expecting it to come in with the angle tries to flick. That proves to be his undoing. The ball turns a little, beats the bat and hits the stumps. 20.44 IST: Yuzvendra Chahal to Mayank Agarwal, SIX! That is probably the shot of the match! Wow! This is tossed up outside off, Agarwal goes down on one knee, reaches out for it and lofts it over the covers fence. A very difficult shot that but he has made it look very easy. 20.43 IST: Yuzvendra Chahal to Chris Gayle, 50 for Gayle, consecutive fifties for him but he needs to convert this one into the big score. He works this through square leg to get to that milestone. He raises the bat as his teammates are on their feet applauding the effort. 20.41 IST: Moeen Ali to Mayank Agarwal, FOUR! Deft! Mayank goes down on one knee and plays the paddle sweep. He plays it fine enough and the outfield is very quick. Another boundary. 20.41 IST: Moeen Ali to Mayank Agarwal, Just short but a brilliant effort by de Villiers. If he could not get, there not many would have. This is short and on middle, Mayank goes back and pull is uppishly towards deep mid-wicket. AB runs in but then realizes he is not going to get there so does well to stop it. A single taken. 20.34 IST: Yuzvendra Chahal to KL Rahul, OUT! STUMPED! Chahal does what he was brought on for. He has broken the opening stand. He gets his revenge. The shot though can be questioned. Having got a maximum on the last ball was this needed? Well, such is the format, the batsman feels he needs to keep going and Rahul perishes in the attempt to do so. He dances down the track but does not get to the pitch of the ball. He still swings but misses due to the turn away. Patel behind makes no mistake. 20.34 IST: Yuzvendra Chahal to KL Rahul, SIX! Rahul gets into the act now! What a shot that is! It is slightly full and on middle, Rahul just lofts it over the long on fence for a biggie. Ideal start after the break too. 20.33 IST: Yuzvendra Chahal will start after the break. 20.30 IST: Mohammed Siraj to Chris Gayle, FOUR! Make that 24 from the over! Siraj has been taken to the cleaners. The Powerplay which started off slowly, has ended with the bang. Punjab are 60 for no loss after it. 20.29 IST: Mohammed Siraj to Chris Gayle, SIX! Brute! That has been dismissed! A nothing delivery to be honest. Short and it bounces at the height of the batsman's chest. Gayle says thank you very much as he pulls it into the mid-wicket stands. 20 from the over with a ball to go. 20.28 IST: Mohammed Siraj to Chris Gayle, FOUR! SLAPPED! 14 from the first three balls. The slower ball and it is outside off, Gayle slaps it through covers. 50 up and Gayle has 38 off it. 20.27 IST: Mohammed Siraj to Chris Gayle, SIX! Once again, that has gone all the way! Gayle is dealing in boundaries here. It is short and on the body, Gayle clears his front leg and then sends it over the long on fence. 20.26 IST: Mohammed Siraj to Chris Gayle, FOUR! Welcome into the attack, Siraj. He feeds room to Gayle outside off and the West Indian powers it over wide mid off for a cracking boundary. 20.24 IST: Umesh Yadav to KL Rahul, DROPPED! Still, a brilliant effort by AB de Villiers. Back of a length ball on off, probably once again stopping onto the batsman, Rahul checks his back foot punch at the last moment and ends up hitting it aerially towards extra cover. De Villiers flies to his right but fails to hang onto the catch. It deflects behind and Stoinis, running across from mid off, reacts well to stop and dive to his right to stop the ball. End of an eventful over. 20.21 IST: Umesh Yadav to KL Rahul, FOUR! Aerial but safe! Full and on middle, stopping a bit onto the batsman, Rahul leans forward and across to play the flick shot but his bottom hand comes off the handle and it goes a bit uppishly towards mid on. Siraj there puts in a full-length dive to his left but it sneaks past him for a boundary. 20.20 IST: Umesh Yadav to KL Rahul, FOUR! Easy pickings! This should get Rahul going. Full and down the leg side, Rahul flicks it through backward square leg and it races away. Ideal start to the over, need to make it count though. 20.19 IST: Navdeep Saini to Chris Gayle, FOUR! Spoils what was a brilliant over till now! Still though it is an excellent one! Length and on the body, Gayle lofts it over mid on and it goes for a one bounce boundary. 20.14 IST: Umesh Yadav to Lokesh Rahul, Length again and on off, Rahul goes back and punches it to covers. Rahul is quite happy to play second fiddle recently and it is the Windies who is taking up the responsibility to go after the bowlers. Seeing something similar till now. 20.11 IST: Umesh Yadav to Chris Gayle, SIX! High and handsome! This is right in the zone of Gayle. Full and on off, Chris lofts it over the long on fence with ease. 10 from the first two balls. 20.10 IST: Umesh Yadav to Chris Gayle, FOUR! Hammered! Slightly short and Gayle picks the length early. He pulls it with utmost power and through mid-wicket for a boundary. Good start to the third over. 20.07 IST: Navdeep Saini to Chris Gayle, FOUR! Enough of sighters for the big man! He winds up and goes for the slog. The ball goes off the inner half through square leg for the first boundary. 20.03 IST: Umesh Yadav to Chris Gayle, A huge shout but not given! The in-dipper on middle, Gayle looks to work it on the leg side but misses. The ball hits the pads, an appeal follows but the umpire shakes his head. The ball seems to be going down leg. 19.58 IST: KL Rahul and Chris Gayle are out in the middle for Punjab. Umesh Yadav to begin for Bangalore. 19.46 IST: Punjab skipper, Ravichandran Ashwin says that they have to try and string wins together. Admits that they have been a bit patchy but also says that they have played some good cricket in between also. Wants to keep ticking all the boxes. Informs that they have four changes - Andrew Tye, Murugan Ashwin, Mayank Agarwal and Nicholas Pooran come in for Hardus Viljoen (down with flu), Ankit Rajpoot, Karun Nair and David Miller. 19.43 IST: Bangalore skipper, Virat Kohli says that there is a lot of dew later on and they like chasing as a team. States that he is backing his batting to do the job. Adds that they have no option but to come out and fight every day. Wants his players to play fearless cricket and enjoy every moment. Informs that they are playing with three overseas players as Umesh Yadav replaces Tim Southee. Also mentions that they expect others to step up and do the job and personally he wants to give his 120 percent everty time he plays. 19.30 IST: Royal Challengers Bangalore win toss opt to field against Kings XI Punjab. 19.20 IST: Dale Steyn gets his 2019 IPL jersey.